If you’re serious about increasing customer loyalty, but haven’t fully considered marketing automation, you’re doing it all wrong. 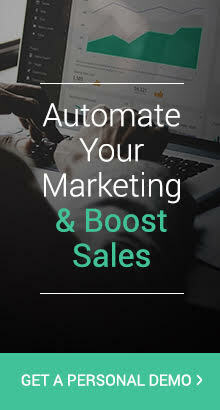 Marketing automation is a great way to increase repeat sales and conversions, predict what your customers might need, and improve your customers’ experience. Doing this will lead to a greater sense of customer loyalty. You might already be utilizing marketing automation, but haven’t thought about how it relates to loyalty. This blog post will talk you through three key automation tactics that you should be focusing on to increase customer loyalty. For whatever reason, when a customer makes a purchase, they may or may not choose to return. As a retailer, unless that customer gives you specific feedback, it’s hard to know exactly why they did not return. To send them a reminder email is a non-invasive way to remind them you exist. Perhaps the reason they haven’t made a second purchase was because they simply forgot you existed. This is a great opportunity to show you’re thinking about them. Or perhaps they haven’t returned because there was a problem with your product. A re-activation email could encourage them to reach out to your customer service team to talk about the issue. This gives you a chance to make it better. The same goes for abandoned carts. So many sales are lost from inactive customers and it’s these customers that are often prepared to spend the most, provided you welcome them back in the right way. A celebration for your customers is a celebration for you. You’ve been a customer yourself at some point, so you should know how great it feels when a company recognizes you. In the offline world, it could be as small as remembering your coffee order. In the online world, it could be something as simple as logging onto your favorite eCommerce store to be presented with a list of personalized items to consider. Personalization and celebrations are paramount. Celebrations, like Christmas or New Years are a great way to encourage customer loyalty. 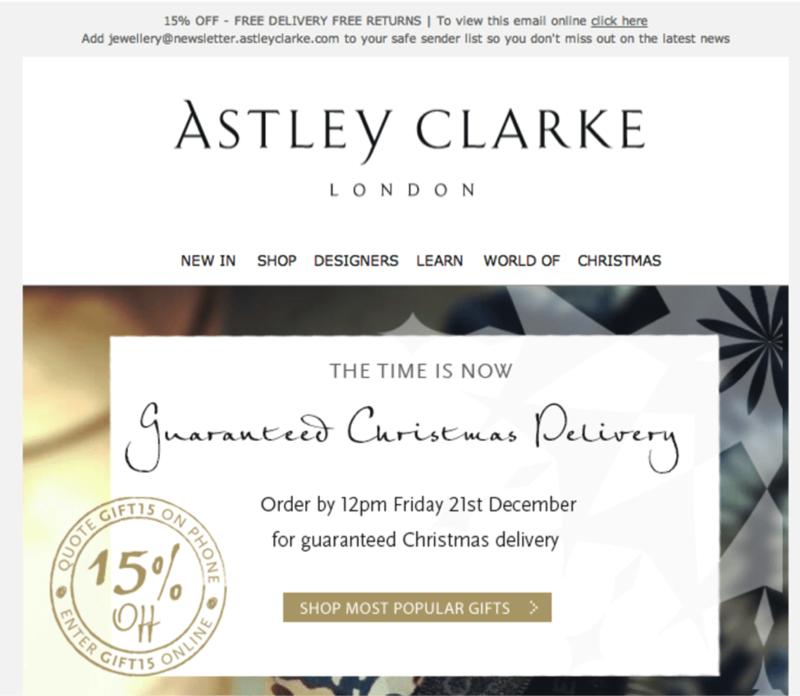 Astley Clarke of London creates a sense of FOMO where the customer feels that if they don’t order before the specified date, they’re going to miss out on a great deal. This sort of automated offer email is crucial in securing further purchases from your loyal customers who are interested in a holiday-deal and returning inactive customers looking to use the deal as an opportunity to buy from a store they’ve previously bought from. For boosting customer loyalty you may also consider your customers’ birthdays. A birthday is a time when a person feels special and enjoys others thinking about them. This doesn’t just go for friends and families, but companies too. 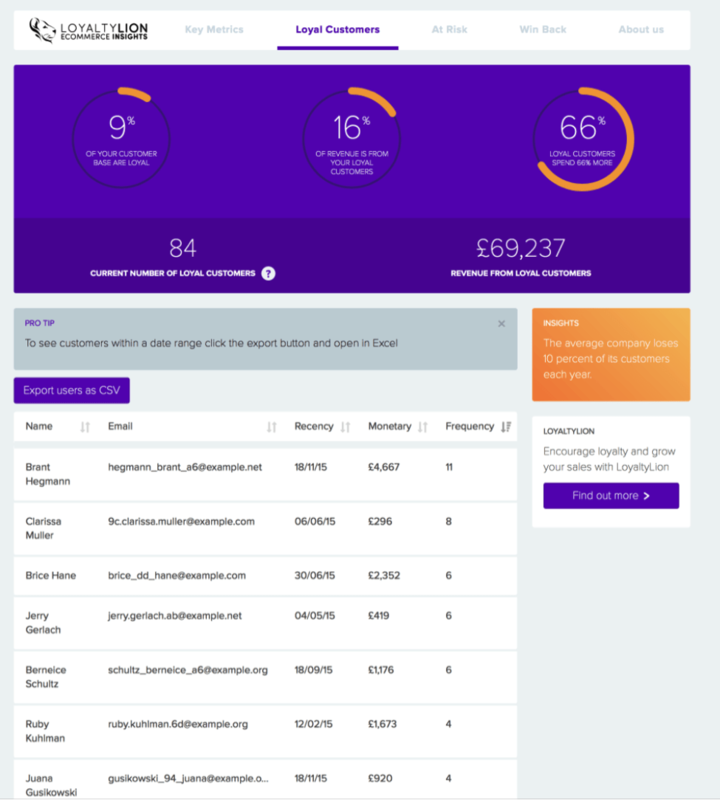 An automated birthday email with exclusive birthday offers helps make your customers feel like they’re part of a community when they buy from you. They begin to feel a sense of value. And customers who feel valued are more likely to return to buy from you, over and over again. 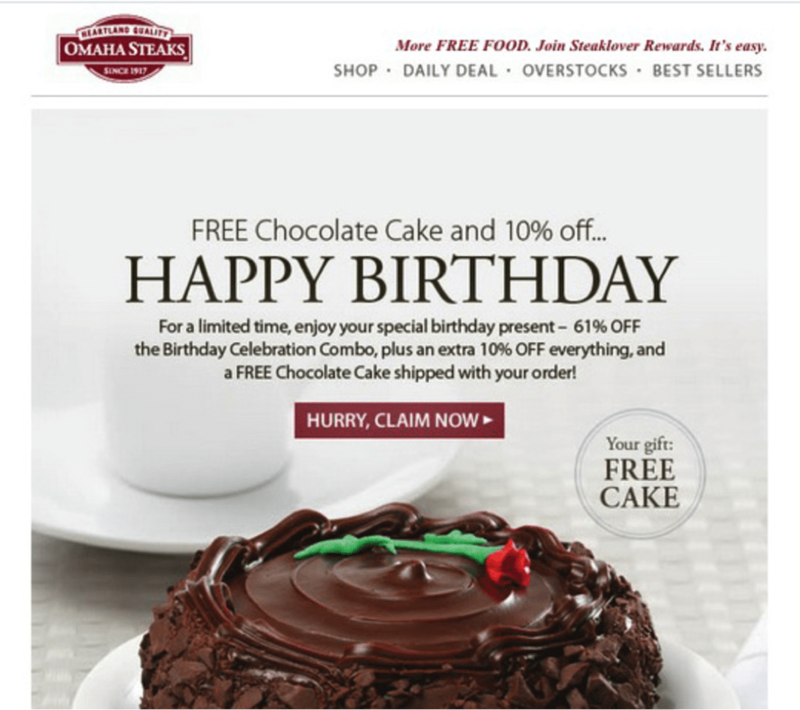 Omaha Steaks uses the birthday automation email effectively by offering the customer a free chocolate cake when they make an order. Not only this, but they offer them 10% off everything or 61% off the birthday celebration combo. Now, even though the customer still has to make a purchase in order to redeem the offer, the fact that Omaha Steaks has even remembered their birthday and made such a generous offer gives a strong incentive to purchase. Is your loyalty marketing automated? When you think about loyalty marketing, you’re concerning yourself with what happens after the customer makes a sale. Specifically, how can you drive increased spendings. Customers who are loyal to you are likely to be your best advocates. This means that they’re going to spread the word about your product to other people just like them. Once you reach this level, you’re getting marketing for free and it’s really invaluable. When you’re thinking about automating the loyalty process, you need to be sure you’re segmenting your customers. Using an eCommerce insights app you should be able to monitor who is spending what in your store. This will quickly help you identify top spenders, people who used to spend lots and haven’t recently, and people who have stopped spending altogether. Using this data, you can personalize the content. Customers who buy multiple items of one product weekly are a different kind of customer to those who buy different products every three weeks, and your marketing efforts need to reflect this. The trick to successful loyalty marketing automation is to be able to link customer behavior with their email or contact details. One way to do this is to implement a loyalty program, as well as by utilizing marketing automation. One alternative is to segment your customers into the different stages of the sales cycle. At each stage, customers will have different pain points. Your marketing should not try to address all these people at the same time as it won’t be effective. Instead, send carefully thought out, targeted content, newsletters or offers to each specific segment. If your marketing automation is effective in providing valuable, relevant content for the right people at the right time, it’s much more likely to move further down the sales cycle. You might already be thinking about ways to increase customer loyalty and you might now be thinking about ways you can use marketing automation to do that. In this blog post, we have discussed how you should consider segmentation, celebrations, and retrieving inactive buyers in order to increase your repeat spenders, improve your customers’ experience and increase customer loyalty. Companies who use marketing automation spend less time trying to sell to their customers and can instead use that time to nurture the relationships they already have with their customers. Jordie is the Content Marketing Manager for Loyalty Lion, a bespoke eCommerce loyalty, and engagement program. When she’s not writing she can be found at the gym or playing with her dog.